I think this is a fair way to sum up the start to each week. I always get to a Monday wondering where my weekend disappeared to. And then my mind roams to all the things I wish I would have accomplished before the weekend too quickly ended. Besides it being Monday, I'm actually excited for this week and everything it holds. Husband's birthday is on Thursday and we are celebrating all week long. I have surprises lined up throughout the next several days, birthday presents to wrap, and a Cider Mill birthday gathering to finish prepping for. I think this week will be pretty phenomenal and I'm looking forward to the promises it holds! Now just to get through this Monday (thank goodness for lunch with a girlfriend!) and then on to the rest of this great week! I hope your Monday has been looking up from the start! 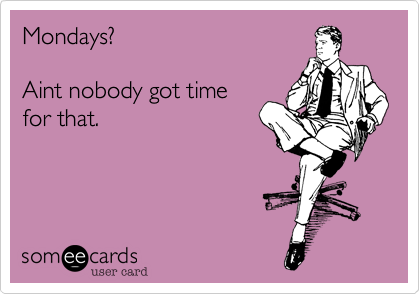 If not, treat yourself to some coffee or chocolate, that's bound to turn any Monday around :) Besides, the best thing about this Monday, is that it will bring fall in, at 10:29 PM on the dot! And for that, I'll love today! And for a hot and hearty meal, check out Flour Darling today for the turkey burger crock-pot chili!